This advice from the incredibly successful Sandra Reynolds (blogger turned cookbook writer) is priceless – whether you want to blog or write a novel. “I simply wrote about what I knew. As it turned out, the single best thing I ever did was simply being honest with my readers. Thanks to my colleague and friend Allison Tait at Life in a Pink Fibro, for the interview with Sandra on ‘Becoming a Cookbook Writer’ (read it, it’s great). 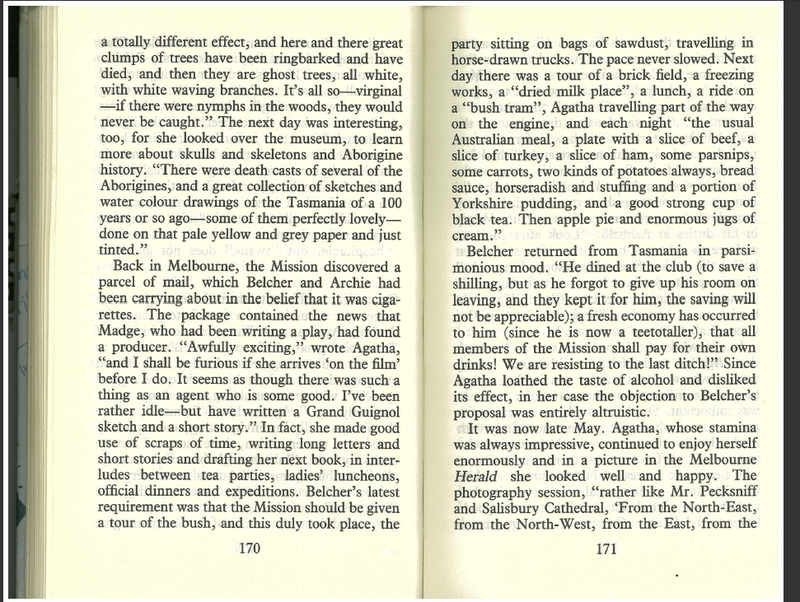 Agatha Christie came this close to being a Tasmanian… Sigh. I was born the year Agatha Christie died: 1976. I’ve also got the same initials as Agatha… I’m not superstitious, but I do admit to being inspired by this. To me – as a crime writer and reader – the great AC is hard to top. I have a bookcase devoted to her books. All of them. Agatha didn’t aspire to any pretensions. And she’s sold over a billion books. 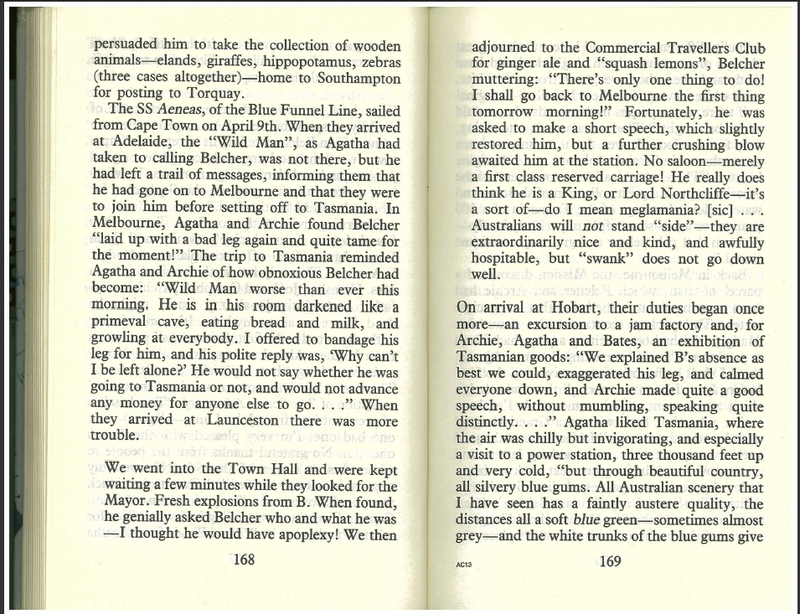 Yes, AC travelled to Tasmania, as part of her grand world tour in 1922. She was entranced by the colours and stories of this island; she even checked out some skulls and skeletons. 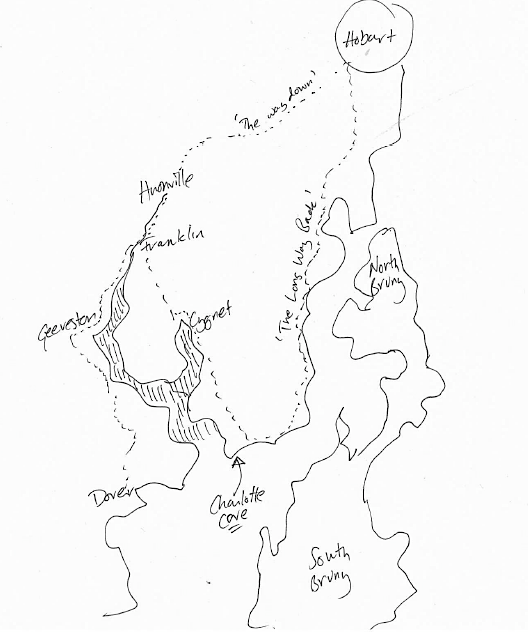 There’s a great map of her 1922 travels at the official Agatha Christie site. However, when I originally looked at it, it didn’t include Tasmania. So, I contacted Chorion to pass on this info I’d found on Agatha’s time in Tasmania. More will no doubt be revealed this year, when HarperCollins publishes Agatha’s diaries and letters from her travels in The Grand Tour – compiled and edited by her grandson, Mathew Prichard. Want to make money from your art, craft or your writing? Want to turn your creativity into a small business or a freelance career? I truly believe that it’s possible to move from whatever you’re doing right now that’s not doing it for you… into a custom-designed career that you really love. There’s a social trend at the moment to downsize debt, and to cut clutter. This is good because, as a general rule, we are fed a diet of information that tells us that we must consume more to ‘be’ more. In order to consume more, we must make more money; in order to make more money, we must work harder; in order tow work harder, we must give up more of our creative energy and personal freedom – and so we lock ourselves into a cycle of work and consumption that is ultimately unsatisfying. Sure, buying new stuff makes you feel great for a moment, but there’s little long-term gain and no creative product to show for it. So how about challenging that idea that you must keep making ever-more money? If you genuinely want to find more freedom for yourself – the freedom that leaves you open to creating for a living – you’ll need to sacrifice short-term gain for long-term rewards. Let go of traditional expectations about how you should make money, and how much money you should make. Everyone has choices, everyone can make the decision about how they make and spend their money. I know everyone’s situation is different, but if you’re not prepared to make sacrifices in order to gain freedom, then you simply don’t want that freedom badly enough. Your ultimate goal might be to work for yourself, and make a living out of your art. That might seem impossible right now, but if you take small steps towards streamlining your life, you will eventually reach a place where you can spend a little less time being an employee, and more time on what matters to you – on creating. Getting to this point is very satisfying, and it becomes addictive. Being less dependent on others/your bank/your conventional income means all the more independence for you and your creativity. Once you have a taste for freedom, you want more freedom – and it’s at this point that thoughts of working for yourself, and making money out of your art, become not only tempting – but possible. I’m not saying this is easy to do, but it’s possible. You just have to make the decision that it’s a lifestyle worth working towards. I can say this stuff, because I have done it. I was in debt when I left Sydney for Tasmania. Despite having a high-paying magazine job in the Emerald City, each week had seen me slip further behind. Not for any outrageous reason. But, regardless of the reason(s), they are nothing more than excuses. You must take responsibility for your situation in order to change it. Despite now being in a good financial shape (with only a small mortgage to tend), those 18 months changed my outlook forever. I’m not going back to ‘spending’, and therefore having to earn lots to keep up. 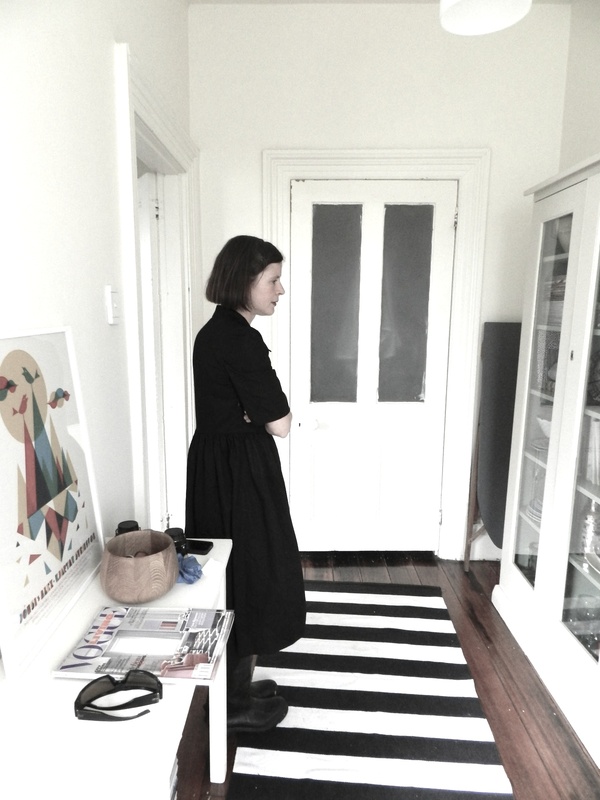 I am happy to continue to live frugally, to only buy second-hand clothes when necessary, to grow our own vegies, to walk whenever possible, to not own a credit card… because I know it grants me the freedom to choose what work I do, and where and when I do it. In fact, I want to take this concept even further this year ­– to depend less and less on making money the conventional way, and to create more and more space and freedom for doing things my way. … it’s the Huon Valley. A bunch of influential global travel experts – Mr & Mrs Smith, for example – have named Tasmania’s Huon Valley as one of the top-10 places to check out this year. This in partly due to the Valley’s growing and well-deserved reputation for artisan and organic produce, but the vistas are also stunning, and the locals are keeping alive traditional processes (spinning and wooden-boat-building, anyone?) that would otherwise disappear. The Huon is also where Matt Evans’ Gourmet Farmer is set, it’s where Tetsuya built and launched his boat from, it’s where you can check out the up-coming Taste of the Huon, it’s where Tassie’s Apple Isle moniker was born… and it is easily one of the most picturesque places I’ve ever seen. I’ve been compiling an arts and heritage strategy for the region, and have had to spend a lot of time in the Huon’s five main townships of Dover, Geeveston, Huonville, Cygnet and Franklin. Each has a distinct flavour, and travelling the full ‘circle’ from Hobart and back is a memorable journey. I remember childhood trips to the Huon with my English-born grandparents (who loved to go to there to experience a little bit of the ‘home country’), and the winding country roads lined with autumn’s vibrant trees and Cape Cod-style cottages. But I hadn’t been back in decades, and I now see I’ve been missing out. Little has changed the Valley’s gentle, peaceful ambience over the years, and it’s the first place I send visiting friends when they arrive in the state. So, when you’re in the Huon, you must get your art on at the Church Studio, you must anchor in Charlotte Cove (and dream about buying property there), you must buy a Summer Kitchen pie (go the Hunza or the Humity), you must stand on the enigmatic shores of Dover, you must listen to a gig at Red Velvet Lounge, you must stay in the teepees at Huon Bush Retreats, and you must buy some wares from Steenholdt’s Organics – which my mates at Island Menu have often been inspired by. NOTE: Take the long way back to Hobart from Cygnet (not the short-cut), and you’ll be rewarded with breath-taking views along the coast – and the chance to pretend you’re time-trialling (just don’t tell the authorities I said that). PS: I know I said I was Not Using Images, but thought a little context would help in a travel post. Want to write a great magazine or newspaper article? What does it take to discover that one unsung idea, pitch the piece to an editor, produce the thing and see it through to published completion? It’s a hard-to-pin-down process; when I wrote my first published article, about 13 years ago, I stumbled blindly through the whole thing. But despite having written thousands and thousands of published words since, seeing my byline in a publication still gives me a little kick. Note: Although my focus this year is less on being the messenger (ie. documenting the achievements of others) and more on being the message (creating my own achievements), there’s no doubt that when you come across a great story about someone/something/somewhere else, it’s empowering to be able to tell it. I’ve just finished two stories about Tasmania – one for House & Garden magazine, and one that has no home as yet (but will likely end up in a national food magazine). I do not take the opportunity to write these features for granted: interviewing interesting people, in beautiful locations, while working with some of the most talented people in the business… it certainly beats sitting at a desk all day! So, I thought I’d do a few posts on the process of freelance writing for magazines, or newspapers, or websites (or whatever takes your fancy). I know instinctively how I do this, but I’ve never put it down in black and white. If there’s anything you want to know about writing freelance features, let me know! The above is a pretty accurate description of what living on an island means to me (I’m sure the Mercury won’t mind me paraphrasing myself). Of course, I wanted Tasmania to challenge me, but that doesn’t mean I haven’t also wanted to throw in the towel. So, prompted by the fresh western New Year (and tomorrow’s Chinese New Year), I’ve had a think about what each year in Tasmania has taught me. I landed in Tasmania an exhausted, burnt-out thing. The preceding couple of years had been emotionally and financially debilitating. I was so tightly wound, I even had to learn how to sleep all over again. As a prodigal son, I also made mistakes. I tried to transplant my Sydney way of doing things into Tasmania. My high expectations, my way of doing things very fast… not the most successful approach. There was a lot of friction. Oh, and I was fired for the very first time in my life. Which, as it turns out, did me a favour – I launched my MADE Tasmania business not long after. I also started, and paused, my Masters (as one of the many fumbling ways to try to work out what I wanted to be doing). The magic part of 2009 came in getting married (to someone who is the support and inspiration I didn’t even ever know I needed). New year, new full-time advertising job. And the clear decision to clear debts. I was on a mission. So, 2010 was a blur of full-time and freelance work… Seriously, I don’t really remember much but the fact I was working every minute. However, in hindsight, it was a year where I put down some solid foundations in the search for freedom, even if at the time I wasn’t sure what I was peddling so hard towards. What. On. Earth. Am. I. Doing. I spent the whole year asking this, in-between spinning like a mouse on a wheel. I was working hard, still managing a freelance business while working full-time. Trying to finish my novel in snatched moments. There was so much stress, and not enough time spent with my new family. The year was a whirlwind of doing – but doing for others, mind you. There was nothing I was genuinely doing for me. I said yes to a squillion projects, hoping that one of them would show me what I should be doing, yet none of them did. I got to the end of 2011 and realised every day had been spent in a state of responsibility and commitment. No personal creativity or expression, no free weekends, no reflection, no sweet spots of getting lost in something for the simple joy of it… Everything I did, I felt obligated to do. When prompted, I couldn’t even think of one thing I loved doing just for the sake of it. BUT it was a massive wake-up call to even realise this, to realise I was reincarnating my Sydney habits all over again, and it propelled me into having a good hard look at myself and my life. Ah – the Year of the Dragon (which I am; a Fire Dragon actually). My year? I’m going with that. And that is such a weight off my shoulders. No, not what we were taught at school… Running writing is the writing I do in my head when I’m running. Running is something I’ve recently gotten back into, as a way to expend my considerable creative and nervous energy in a productive way. I have a tendency to expend that considerable energy in an unproductive way. Usually, drinking and being a dirty stop-out. For example, during the period when I was a newspaper columnist, I reported on Sydney’s coolest events and parties (oh boy, have I got some stories from those days!). Every night started with the promise of so much, and I never wanted to go home. I spent a year meeting punishing daily deadlines with a 365-day hangover*. As a creative person, drinking and partying certainly burns up the energy and provides a certain dubious creative outlet. It is undoubtedly the path of least resistance to ‘expressing’ your creativity. But, when you wake up in the morning, there’s nothing to show for it. Now that I’ve broken through the initial two-week pain barrier, I’ve reached that blissful stage where I’m writing in my head as I run. I don’t ask or expect it to happen. The welcome monotony and freedom of running frees up my thoughts. I write articles this way; I write whole chapters for my books. The physical act of running is a good metaphor for the type of writing it produces. Writing that flows, that has good rhythm, that is without restrictions (mental or space-wise). Don’t worry that you won’t remember what you’ve written in your head. Even if you don’t get it down word-for-word, running writing flavours what you do for the hours afterwards. And don’t worry if you don’t like running. Walking is just as good. Washing dishes. Or, as Agatha Christie liked to do it, soaking in the bath while eating apples. 1. I’ve edited and published lots of books for other people, and worked as a book publicist at one time, as well as working in-house at Random and freelance for HarperCollins and Murdoch Books… ie, I know what I’m doing. 2. I have an April deadline I want to meet for plot reasons – going the traditional path will mean I’ll miss this deadline. 3. I’m not publishing a novel to make money – I’m doing it because I want to tell a story. Breaking even would be sufficient! 4. I have a large network of people who I can tap into for assistance and support – creative friends for cover design, for example, and also the media (my colleagues). 5. I’ve recently won a Scarlet Stiletto award for a short crime story, and now’s a smart time to leverage a novel off that. 6. And I have come to the realisation that trying to fit myself into the conventional publishing model was sapping my inspiration and just feeling plain wrong. I just couldn’t get interested in it, it was frustrating me, and I realise it’s one of the reasons why this project has dragged on longer than I wanted it to. But mainly, this decision is all about cutting out the middle man. I’m over having to give away my power to people who are gatekeepers of contrived conventional processes. Just because I’m told it’s the way to do things, doesn’t make it right or true. Thanks to the magic of technology, I can do things my own way. This is not to denigrate traditional publishing, by any means. Traditional publishing works for many, and it’s an industry I’ve loved working in – but I know it’s not for me when it comes to my book(s). So, I’ll be selling my book online – both as an ebook and as a physical hard copy. Maybe I’ll sell it through a couple of bookshops (but then maybe not, as I’m not that keen on giving them 40%). I’m very curious to see how things go.